Rajiva Wijesinha has been attracting attention in recent weeks due to his unfortunately rather lonely stand from within government ranks against the impeachment of the Chief Justice. It would have been easy to keep quiet, so he deserves a round of applause. But it is the effort that he has been making to engage with people in the North and East to find out what they need or want to rebuild their lives that is even more important. Unlike other government politicians, who meet this constituency only when they are laying a foundation stone for an infrastructure project that they are hoping to take credit for – or get a cut of – without the slightest concern as to whether it is actually a priority, Rajiva has been listening to them and communicating what he has been told to the rest of us through his column in the Daily News. Of course what people feel confident to share and what that newspaper cares to publish can be nowhere near the whole story, but even a very partial account is valuable in understanding the ground situation in the former conflict areas. One conclusion that he has come to as a result of this experience is that to get things done there is a desperate need for transparency in government operations. In one of his recent articles, he has urged action on a Right to Information Act, which he points out was one of the recommendations of the LLRC. We’ll soon find out whether being included in the much referred to LLRC Action Plan means anything! A Right to Information Act is long overdue. The LLRC Report notes that such laws have been adopted by virtually every other country in the region, including India, Pakistan, Bangladesh, Nepal and the Maldives. Senior politicians in those countries have realised that it is only way to ensure that their policies are implemented. Bureaucracies throughout South Asia – and indeed worldwide – suffer from inertia and corruption, and they are subject to many other influences and pressures than those coming from the top. Interference by juniors is also an issue, and it can be difficult to embark on an initiative to discipline them when their indiscipline has become part of the political culture. As a result, people get disenchanted, either with their party or with the system as a whole. Of course a Right to Information Act makes it easier for citizens to expose the wrongdoings of ministers and presidents as well, but it is now generally recognised that the benefits outweigh the costs, even for them. From the point of view of citizens, this is wonderful news, since the legislation can be an extremely powerful tool in challenging budding dictators, never mind democrats. The need in Sri Lanka is clear. There is no longer any such thing as ‘information’ in this country. There is only hearsay. Consider the rather innocuous matter of expenditure on Deyata Kirula. Last week, the UNP blamed the Government for spending Rs. 26.5 billion on what they dubbed a carnival when so many people have been affected by flooding. The money should be used for their rehabilitation, a spokesman argued, since it is clearly not possible to build a house within the allocated sum of Rs. 100,000. So far, so easy to follow. But then the Government claimed that the exhibition would cost only Rs. 40 million, with the remainder of the allocation of Rs. 60 billion being for development work in the four districts of Ampara, Batticaloa, Trincomalee and Polonnaruwa. And the JVP added that of the Rs. 25.5 billion spent on Deyata Kirula last year, in Anuradhapura, only a single building remained, supposedly a paddy store, but it was located so far away from paddy areas that it could not be used. As things stand, there is absolutely no reason to trust the Government and absolutely no reason to believe the Opposition. Whoever happens to be near a microphone says whatever comes into their head, never mind whether it is true or even whether it corresponds with what they said yesterday. And tomorrow they will have no qualms in telling us the exact opposite. Most people respond by closing their minds, no longer willing to try to separate fact from fiction. 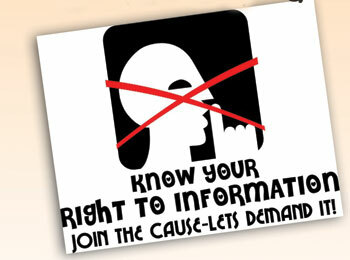 A Right to Information Act can help to get out of this dangerous rut. Properly formulated, it would do a great deal towards restoring the category of ‘information’, by forcing the Government to give truthful answers to questions put to it by citizens or face the consequences in court. A key feature of the legislation is the penalties that it imposes on officials for failing to respond within given deadlines, for giving incorrect or incomplete replies and for destroying evidence, including fines to be paid by them personally. That this is effective may be seen in the growing number of activists who are being harassed or attacked. This is not a matter of the enlightenment of its leaders, although it is surely not a coincidence that both the Right to Information Act and the National Rural Employment Guarantee Act were passed in 2005, just after the return to office of Congress with the support of the Left Front. Rather, India does well in the global ranking because its Right to Information Act was the result of a sustained and well-supported campaign by civil society, and civil society is strong enough to prevent Manmohan Singh from succeeding in his now regular attempts to water it down. Sri Lanka must take note. I recall writing in support of a Right to Information Act in 2010, when it was reported that the Ministry of Justice was preparing a draft. But nothing emerged, with no constituency pushing for it. Now the LLRC Action Plan says that it is the responsibility of the Media Ministry. Even if the Government finally makes up its mind to pass the legislation, without proper scrutiny, Sri Lanka is bound to end up with the world’s worst example. For a long time, the category of ‘civil society’ in Sri Lanka was practically non-existent, since all space was occupied by NGOs and they were totally discredited by the positions they took during the war, among other things. There was little hope of them bringing pressure to bear on the Government. Indeed, although people in other countries were ever ready to listen to them, they didn’t seem to have much idea of how to use the vast sums of money they were getting to influence Sri Lankans. The Government would have us believe that nothing has changed. All dissent – even very mild disagreement – is said to be connected to NGOs and foreign plots, usually terrorist-inspired. But the more extraordinary its actions, the more obvious it is that this is not the case. With the impeachment of the Chief Justice, another segment of ‘civil society’ has risen up in protest – lawyers. Like academics before them, whose three month long trade union action was the most effective challenge to the Government since the end of the war, in the sense of starting a debate on an issue of genuine importance, they are part of the mainstream. It isn’t easy to dismiss them. When they come out onto the streets, unlike free trade zone workers and fishermen, they are not subject to live firing by the Police. At least, not yet. And their real strength lies in convincing people, not in waving banners. They enjoy considerable respect among the rest of the population, and they have the capacity to lead them, if they so wish. Let’s hope that they also take up the cause of a Right to Information Act, since it is clear that Rajiva Wijesinha alone cannot make it happen. This article was published in the Midweek Review on 9th January 2013. The internet version may be accessed here.